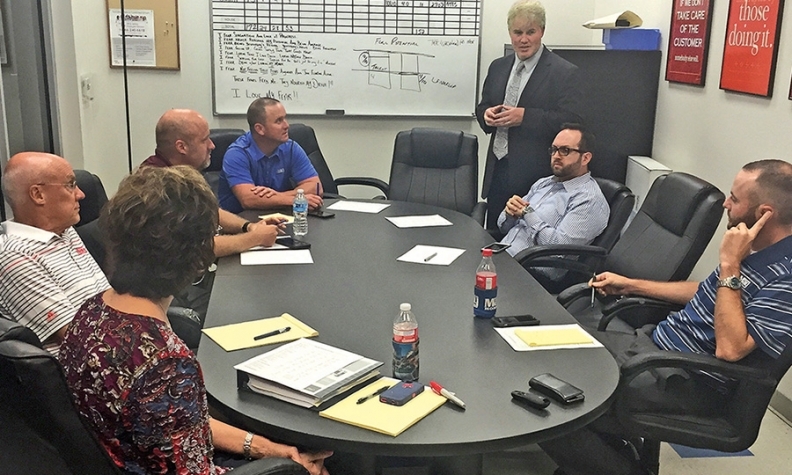 Hockey coach-turned- motivational speaker Scott Muscutt, standing, meets with employees of Greg May dealerships every month. Although the message varies, staffers always leave fired-up and focused. At Greg May Honda in Waco, Texas, and Greg May Chevrolet in West, Texas, everybody looks forward to the visit from the hockey coach. Once a month, Scott Muscutt, a former minor-league hockey bench boss who found a second career as a motivational speaker, spends a day at each store, meeting with managers individually, then addressing staffers in a group. The high-energy talks deliver a different message each month. It may be about leading by example, or the role of trust in teamwork. In August, when management laid out a goal to set a sales record, the main point was perseverance -- staying upbeat and on task, even when things go wrong. What's the same every month is that the Greg May team members walk out of the room full of confidence, determination, team spirit and focus. "I just love these sessions. Everyone does," said Rose Mary Hunter, comptroller for the two stores. "They bring us all together and remind us we're all working toward the same thing. We all have important roles, and we can reach this goal together." The Greg May dealerships exemplify a common feature of the stores on this year's list of the 100 Best Dealerships To Work For: great employee communication. Whether it's about keeping everyone informed, celebrating successes, correcting mistakes or just getting to know one another as people, clear and open communication is a must. At the 100 Best Dealerships To Work For, communication flows both ways. Here are responses from those dealerships to 2 questions on the topic. How often does your CEO/president host regularly scheduled employee meetings? How often does your organization regularly conduct a formal survey of its employee population? Please consider only workplace satisfaction or employee opinion surveys, either administered internally or as part of a competition. In the 100 Best Dealerships To Work For, it occurs in many different forms. Chuck Gile, owner of Motorcars Toyota and Motorcars Honda in Cleveland Heights, Ohio, posts "Word of the Day" video messages, highlighting dealership news and hailing good deeds, punctuated by a couple of toots on his kazoo. One "Word of the Day" clip highlighted a technician in the Toyota store, Jon Biggom, as "hero of the day." A customer's delivery of a used Camry was held up because a radio component to be installed hadn't arrived. Biggom overheard a discussion about the matter, and promptly pulled the part out of his own Camry to get the customer on her way. The technician has been at Motorcars for 10 years and said he has no desire to work anywhere else. "It's like family," he said. "I plan on staying here as long as I can." Planet Subaru in Hanover, Mass., celebrates the achievement of key goals or performance records with a group dinner for employees and their spouses, usually about 25 people in all, at one of the chic restaurants on Boston's South Shore. These days, the way Subaru's sales are climbing, the dinners are occurring about once every three months. Sometimes the dinners cost as much as $5,000, says owner Jeff Morrill. But he says the nights out are important to communicate to employees the kind of corporate culture he and his brother are trying to develop. "We promote ourselves as the undealership," Morrill said. "We do things differently than the typical dealership." The pricey dinners are meant to show the store's staffers they are highly valued, and express appreciation to their spouses and significant others for those times when managers and employees come home late. And they serve as examples of how the Planet Subaru team should treat customers. Not all communication has to be about business. At Warren Henry Jaguar in Miami, President Warren Zinn regularly records tongue-in-cheek video messages for staffers. Called Warren's Wonderful Words of Wisdom, they are done in a whimsical style that reflects the fun and relaxed atmosphere the Warren Henry Automotive Group strives to create. In one that went out last year, Zinn, seated at his desk, turns to the camera and asks in deadpan tone, "Do you ever have the feeling you're being watched." He then adds, "How about now?" and for several long seconds he holds his stare at the camera, expression blank the whole time. In the fast-paced environment of a bustling dealership, it's important to keep everyone informed of changes in the business, new procedures and customers' needs. But there's more to creating a great place to work than making sure the whole staff stays on task. At Patriot Subaru in Saco, Maine, every day a group of employees is invited to lunch with managers to keep in touch about what's going on -- not just in the store, but what associates are doing outside of work as well. Owner Adam Arens said the lunches between managers and the store's associates provide a way of bringing the group together. "We have to erase the idea that you're there just to do your job," he said. "So the topic of conversation can be what can we do better in the dealership, or it can be last night's ballgame or what's going on in your life, what's going on with your family." One group lunch uncovered some charitable work an employee was involved with. Arens decided to support it. That led to a program in which any employee can get financial support for charitable projects. This year Patriot Subaru is supporting more than 50 employee initiatives, with donations of $250 to $2,000. The program reinforces company culture, Arens said, adding, "We have a mission: to serve our customers, our communities and each other." 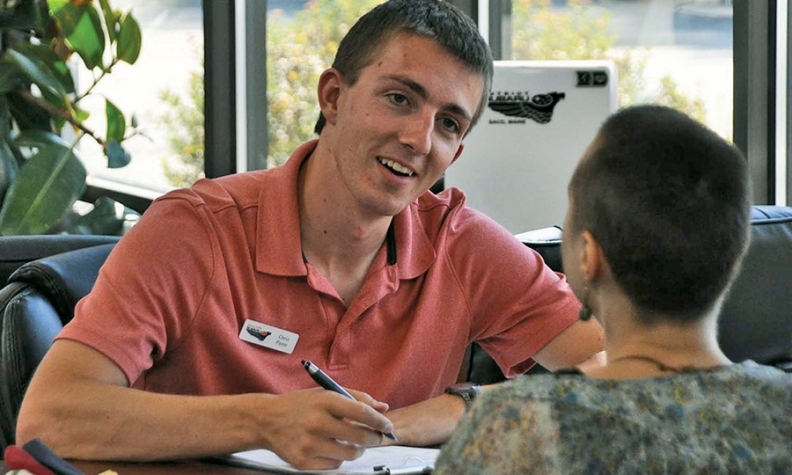 Salesman Chris Paine works with a customer at Patriot Subaru, where communication is a key. Back in Texas, the Greg May stores supplement the monthly visits from their favorite hockey coach with weekly managers' meetings, where the point is refined to an idea that each person jots on a sticky note. Early in August, the stores were behind in their quest for gross sales of $700,000, and the idea was conquering adversity, recalled Hunter, the comptroller. For her, that meant blocking out distractions so she and her team could process deals as the sales pace accelerated. If the team was going to meet its goal, accounting couldn't become a bottleneck. And it wasn't. A wave of deals came in the second half of August and gross sales surged past the goal. Hunter said communication among team members was crucial, especially the reminders that came out of the motivational sessions with Muscutt.